It's that time of year again, time to review a Saint Arnold Winter seasonal. Last Winter, I reviewed Winter Stout, this time it's Christmas Ale. 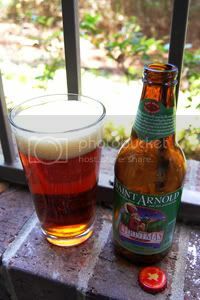 Saint Arnold introduced Christmas Ale back in 1995 as their first ever seasonal brew. The style, according to the brewer, is Old Ale. However, other sources list it as a Winter Warmer. As Christmas Ale, to me at least, more closely resembles the profile of a Winter Warmer than an Old Ale (it isn't aged for one), that's what I'm listing it as. If you think I might be mistaken, please weigh in with a comment. Saint Arnold describes the beer as a "rich, hearty ale perfect for the holiday season with a malty sweetness and spicy hop character." They use five different types of malted barley in Christmas Ale, making it a very sweet and alcohol-filled proposition. It must be working, because the beer has won two gold medals at the Real Ale Festival, a bronze at the World Beer Cup and silver at the World Beer Championship. Appearance: Perfectly clear rust-red body you could read a newspaper through. With a regular pour, the head can be disappointing, but with just a little more aggression you can easily get a solid finger's width worth. The head rapidly recedes into a simple ring around the edge of the glass, and leaves minimal lacing. Aroma: Spice and sweet dark fruit over a rich, boozey malt backbone. Reminds me of a Scottish Ale in some ways (though with much more banana). Taste: It's much the same in the mouth: a solid, sweet malt character with lots of spices to match. Anything besides spiciness from the hops is subdued here, in keeping with the style. The alcohol is certainly noticeable, but complements the other flavors, rather than clashing with them. It's snowing tonight in Texas as I write this, and the booze is certainly welcome. Mouthfeel: Chewey and medium-bodied with alcohol warmth throughout. As you'd from a Winter Warmer (especially with the somewhat lackluster head here), carbonation is on the moderate side. Drinkability: With the 7% ABV, the buzz will catch you well before you get sick of the taste. On a cold Texas night like tonight, Christmas Ale makes a welcome friend throughout the evening. Verdict: Whenever I check the beer aisle, I always check to see if it's time for the next Saint Arnold seasonal to come out. Christmas Ale is just another great reason to be on the lookout. Nicely balanced malt and spice, with a good splash of booze, it's a proper winter warmer. Well worth picking up, especially at the bargain prices you see here in the Houston area.